From My Files Friday: 3-27-15) Rep. Tim Murphy’s controversial Helping Families In Mental Health Crisis Act never made it out of a House committee last year, but the Pennsylvania Republican says some form of it will become law this year now that he has found a Democrat in the Senate willing to support his controversial reform efforts. In a press release last month, Murphy reported that Connecticut Senator Chris Murphy had discussed “areas of agreement” with him that made both of them believe “Congress could act and pass a bill during the current session.” That statement came as a surprise to the Democrats in the House who I polled. They insist the bill will remain buried in committee unless Murphy agrees to drop several changes, including his attempts to reduce the size and importance of SAMHSA and drop his push for Assisted Outpatient Treatment. Stay tuned. Here’s a blog that I wrote in December 2013 when his initial bill was introduced. Rep. Tim Murphy (R-Pa.) introduced legislation today that would make significant changes in our nation’s mental health care system. Spurred by the mass killings in Newtown, Murphy’s proposed bill, The Helping Families in Mental Health Crisis Act , would slow the current push in the mental health community toward self-determination at any and all costs toward a more paternalistic view. For advocates such at Dr. E. Fuller Torrey, who played a key role behind the scenes in helping shape the legislation, passage would be a major victory. For the Bazelon Center For Mental Health Law and other consumer activists that have guided much of the government’s recent mental health thinking, it would be a set back. Murphy, who is the only psychologist serving in Congress and has an inside working knowledge of our mental health care system’s successes and faults, is proposing changes based on testimony at several hearings that the Energy Commerce Subcommittee on Oversight and Investigations held during this year. His bill targets 12 areas for major reform. Each is important and several are controversial. Here’s three that I believe are crucial. Changing federal HIPAA and FERPA laws so that parents and other caregivers can have access to medical records even if an individual with a serious mental illness refuses to sign a release after they are admitted into a medical facility. While it is important to safeguard privacy, HIPAA has been used to prevent parents from helping someone who they love. Here’s an example. 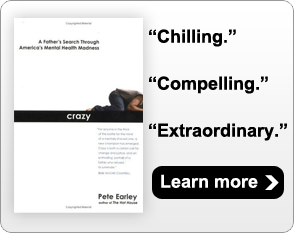 A parent who reads this blog took his son to an emergency room where he was admitted onto that hospital’s psych ward because he was considered both psychotic and dangerous. However, the hospital refused to even acknowledge the son was a patient after he refused to sign a HIPAA release and then doctors discharged him without informing his parents even though he lived in their home. Parents and other caregivers need to be part of the recovery team, not seen as adversaries or enemies, and in too many cases that is how they are treated. Rep. Murphy’s bill correctly notes that “federal funding for mental health is disjointed.” Mental health permeates every aspect of our society, yet there is no one in the federal government who is taking a comprehensive look at the different government agencies, such as housing, drug and alcohol treatment, transportation, veterans, and human services, and how they interact when they deal with persons with mental illnesses. While I am not keen on adding to the federal bureaucracy, this legislation would create an Assistant Secretary at Health and Human Services who would be responsible for monitoring all federal mental health efforts. The bill also would create an Interagency Serious Mental Illness Coordinating Committee. In addition to the directors of the Centers for Disease Control, the National Institutes of Health, and National Institute of Mental Health, this committee would have six non-federal employees — including at least one individual with a diagnosed serious mental illness and also a parent or caregiver of someone with a mental illness. The assistant secretary is required to be a PhD/MD in psychology and/or psychiatry with clinical experience in practicing integrated care models. While I understand why Rep. Murphy wants a professional running things, I wish he would have left the directorship open for someone such as Judge Steven Leifman in Miami. He has forced bureaucrats in Florida from the private and public sector to collaborate and that quality is exactly what is needed in an Assistant Secretary for Mental Health. Regardless, it is time for someone to monitor all federal activities and coordinate mental health care needs. If a state wants to receive block grant funds, it must meet new criteria. One of them is changing involuntary commitment laws to focus on a “need for treatment” standard rather than requiring dangerousness. This shift has always been important to me because of how my own son and I were turned away in an emergency room. England and France have “need for treatment” standards with built in safeguards to protect individual rights. Focusing on treatment rather than danger should make it possible for people to get care before they are abandoned on the streets or become dangerous. This will only work, however, if there is treatment available. We must make community care accessible and that is going to require much more than simply forcing states to change their involuntary commitment criteria. The bill also requires states to implement Assisted Outpatient Treatment laws. This will be one of its most controversial aspects. AOT allows persons with a history of repeated hospitalizations or violence to be required to undergo treatment, including forced medication. The bill further will anger mental health activists who have helped shape our current system by removing $460 million in block grants from the Substance Abuse and Mental Health Services Administration ( SAMHSA ) and putting it under the direction of the National Institute of Mental Health. SAMHSA and its leadership were frequent targets during Murphy’s subcommittee hearings because of the agency’s apparent lack of interest in serious mental disorders and its funding of programs that encourage individuals to stop taking medication. The bill also modifies the Institutions for Mental Disease (IMD) Exclusion, which was what the federal government used to force states to close large state hospitals. The IMB limits inpatient facilities to 16 beds or less — otherwise they can’t get Medicaid reimbursement. The new law would allow for 32 bed facilities and also for Medicaid reimbursement for telemedicine under certain conditions. The bill would cut funding for PA services to $5 million. I’ve only spotlighted a few of the legislation’s most significant changes. There are also provisions intended to increase: volunteerism by doctors, additional mental health education, expanded use of information technology, and more research. Whether or not this legislation moves forward is still to be seen. But Rep. Murphy deserves kudos for pinpointing specific problems in our system and trying to actually fix them rather than just throwing more and more money into a disjointed system that clearly isn’t working or calling for yet another blue ribbon panel to examine our system. When I was a teenager, my best friend owned a 1957 Chevy that was slick. He paid for chrome rims and jazzed up its interior. He added an 8 track tape player and other bells and whistles. But he never did anything to the engine and when his car stopped running, all he had was a beautiful roadside relic that didn’t run. Rep. Murphy’s bill pays attention to fixing the engine.